At Bluewater Plumbing, Heating, and Air Conditioning we are committed to providing you with the highest level of customer service and superior products anywhere in the Bronx. For over 2 decades we have built a reputation as a leading plumber in the industry. From major and minor repairs, to brand new installation, systems upgrades, and even full kitchen and bathroom remodeling, we offer a wide array of work that covers all areas of your home and business interior. When you need a Bronx plumber, air conditioning company, or heating contractor you can trust to do the job right - the first time - and provide good customer service, all you have to do is give Bluewater Plumbing, Heating, and Air Conditioning a call. We can do it all! From plumbing installations to heating repairs in the Bronx, our team of experienced and licensed technicians are happy to provide top quality results for both our residential and commercial clients. Call us today to schedule service for your plumbing, heating or air conditioning needs in the Bronx. Plumbing Repairs and Maintenance - Whether you're dealing with a pesky leak or need full system replacement, we offer complete repair service for all of your plumbing, heating and air conditioning systems. Heating and Air Conditioner Repair and Maintenance - Let our technicians inspect your heating and cooling equipment and then provide you with solutions practical solutions that give you long term results. 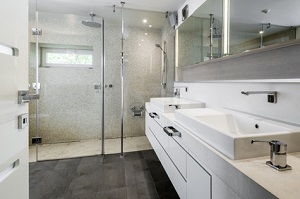 Full Room Remodeling - Before you begin renovating your kitchen or bathroom, let us help you with the foundational components such as replacing the old plumbing, re-routing the network in order to accommodate the new room design or installing your new bathtub, shower, sinks, or fixtures. Specialized Services - In addition to standard issues, we also take care of the technical stuff! Homeowners regularly turn to us for unique items such as underground pipe location, backflow prevention, radiant heating, and alternative forms of A/C such as ductless mini-split systems and high-velocity air conditioning. If you own a commercial property in Bronx you how valuable your plumbing and A/C is to your daily operations. So when your plumbing or air conditioning breaks down you can call us right away! We'll promptly show up to your property, make thorough and accurate inspections, and then go to work to solve the issues in a timely manner. This minimizes any interruption to your workflow. We are also certified to perform Heating Plant Inspections in the Bronx. Winter in the Bronx can be brutal. Frozen pipes are a regular occurrence for both home and business owners. Thankfully, you can get your pipes thawed quickly! Having your plumbing thawed professionally will ensure that the ice is melted without incurring needless damage to the system. When you contact one of our plumbers in the Bronx, we show promptly show up to your home or business and restore your pipes in no time at all! Call us whenever you need plumbing repairs in the Bronx. If you are looking for a professional Bronx plumber or heating contractor then please call 866-763-5302 or complete our online request form.